The picture really doesn't do this project justice. I really dislike bi-fold doors. They're loud, awkward, and a pinch-point risk. The bi-fold doors on our laundry/furnace room were so hard to open and close that they were often left open, leaving the junk behind them in plain sight. 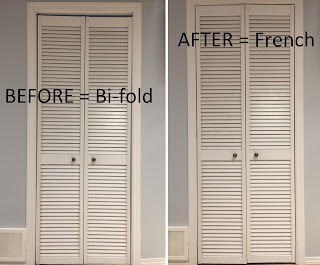 I went searching online for a solution and saw tutorials for converting bi-fold doors to French doors. The process seemed easy enough, so I bought the hardware that I needed, dug out my cordless drill/screwdriver, and gave it a shot. It really was easy, and I couldn't be happier with the end result. No more squeaky, rough sliding, just smooth opening and closing. The doors also open almost completely out of the way now, allowing for the full doorway to be used for hauling things in and out. 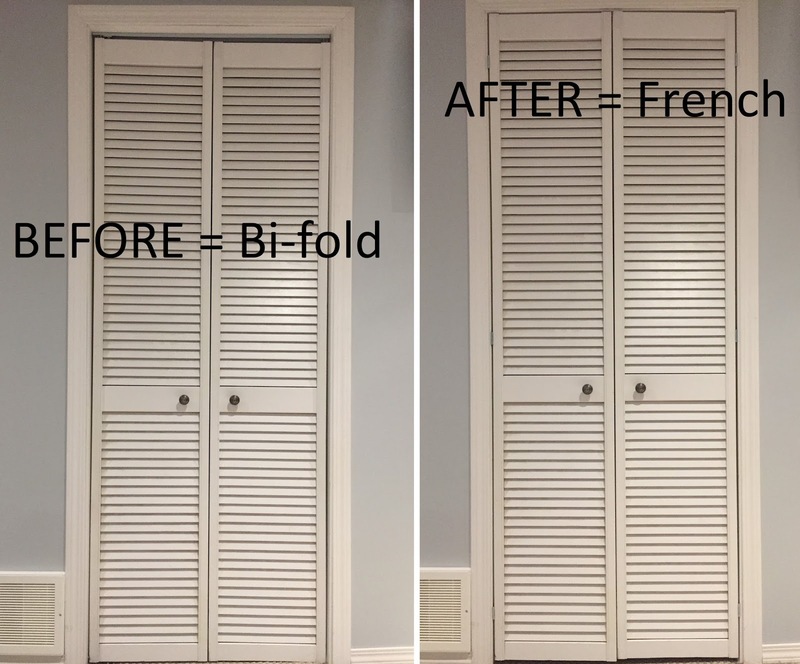 I spent less than $20 to do this conversion and I'm already thinking about converting other bi-fold doors in our house this way. Different tutorials might tell you a bit different order to do things in - I did it in a way that was easiest for me, which was to leave the doors up while drilling and attaching hinges, then removing them one at a time. Read through my instructions and decide for yourself what works best for you. 1. If your existing doors only have a single handle, you'll have to add a second one to the other door. I had a handle that matched the existing one, so I only had to add. If you can't find a matching handle, you'll have to get two new ones and add one and replace the other. Remove the existing handle so you can measure the placement of the hole. Measure and mark the mirror-image spot on the other door, so they are equally spaced from the center of the doorway. Drill through the door, using a bit that is big enough for the bolt for the handle to pass through smoothly. Attach both handles securely. 2. Measure and mark the center of the doors along the edges where the hinges will be attached. Hold a hinge against the door, with the folding edge against the outside edge of the door, centered on your mark, and trace inside both circles with a pencil. Measure and mark down from the top of the doors and up from the bottom of the doors along the edges where the hinges will be attached. I made mine 5" from the top and from the bottom. Hold a hinge against the door, with the folding edge against the outside edge of the door, above or below your mark, and trace inside both circles with a pencil. Do the same for both doors. 3. Use a drill bit that is slightly narrower than the screws that came with the hinges, so the threads will bit into the wood. Drill into the doors inside the circles that you marked. Drill in as far as the screw will be going in. 4. Attach 5 of the hinges to the doors, leaving one of the bottom hinges off so you can use it to trace the hole placement onto the door frame. Make sure that the hinges are folded so that they will open and close the way you want them to. 5. This is when I removed one door (the one that moved completely, not the one with the stationary side). I removed the hinges between the doors, then popped it off the track and removed the bi-fold hardware from the end. Once I had that door attached to the door frame (see below), then I removed the second door, the bi-fold track, and the hardware from the door. This kept my work area less cluttered and prevented me from mixing up which door went where. NOTE: You may want to do step 9 while the doors are down. 6. You may want a second person to help you with this part. I did it myself, by resting the bottom of the door on a narrow wedge (use a piece of wood, a book, a slipper, a folded towel, whatever works). Position the door about 1/4" down from the top of the door frame, making sure that it will close (not all door frames are exactly "square") the way you want it. Once you have it where you want it, mark the top and bottom of where the hinge needs to be attached to the door frame. Lean the door aside and use your 6th hinge to mark the hole positions. NOTE: The hinges need to be positioned so the folding part is outside of the door frame. Drill holes into the door frame inside the circles you marked. Re-position the door and screw the hinge in place, keeping your wedge in place for now (or having your helper hold it) so the weight of the door isn't all on the one hinge. 7. Press the middle and bottom hinges against the door frame where they need to be attached and mark the hole positions. Move the hinges out of the way and drill into the holes. Screw the hinges to the door frame. 8. Repeat steps 6 and 7 on the second door, attaching the 6th hinge to the bottom of the door while you have it down. When positioning the second door, line up the tops of the doors as best as you can. 10. Attach the metal plates to the doors. 11. Stand inside the room and pull the doors closed while holding the magnetic catch up against the top of the door frame. Let both doors stick to it and get it positioned where you want it. Mark the holes with a pencil. Open the doors. Drill the holes then screw the catch in place. 12. The last step is to wash, sand, fill, sand, and paint the areas where the previous hardware was attached to the doors and door frame. DONE! Enjoy your quieter, handier doors!